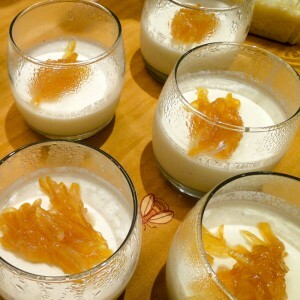 You will love this panna cotta. I recently served this at a dinner party and one 70-something year old gentleman told me over and over that this panna cotta was the best thing he had ever put in his mouth. One of the best things about summer is the cherries. And it is not just that cherries taste wonderful, but they have fabulous health benefits that qualify them as a true superfood. Check out my post on cherries for information on the different types of cherries, cherry health benefits as well as tips and tools for pitting them. Just about everything is better with lemon and vanilla, including this panna cotta. I put vanilla in both the panna cotta base as well as the cherry compote. I use either vanilla beans (my favorite) or vanilla paste (handy, delicious and a little cheaper). I use one long strip of lemon zest to flavor the compote as well as some fresh lemon juice. Note: 1 vanilla bean = 3 T vanilla paste. 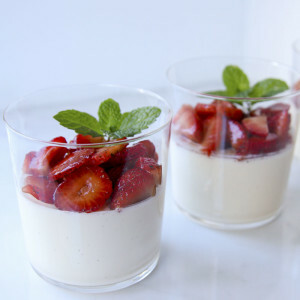 The nice thing about panna cotta is it can be made in advance. 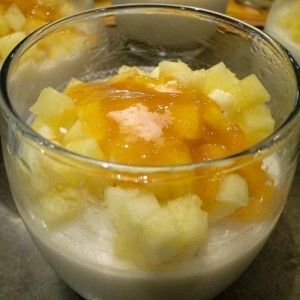 Panna cotta needs a few hours in the fridge to set up before serving. I like to make it a day or two ahead of time when I serve it at a dinner party so I don't have to think about dessert come the day of the party. 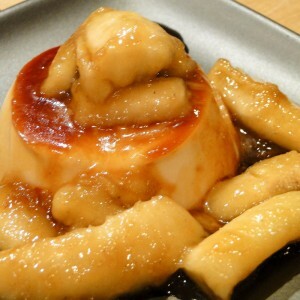 The cherry compote can also be made a day or two in advance. 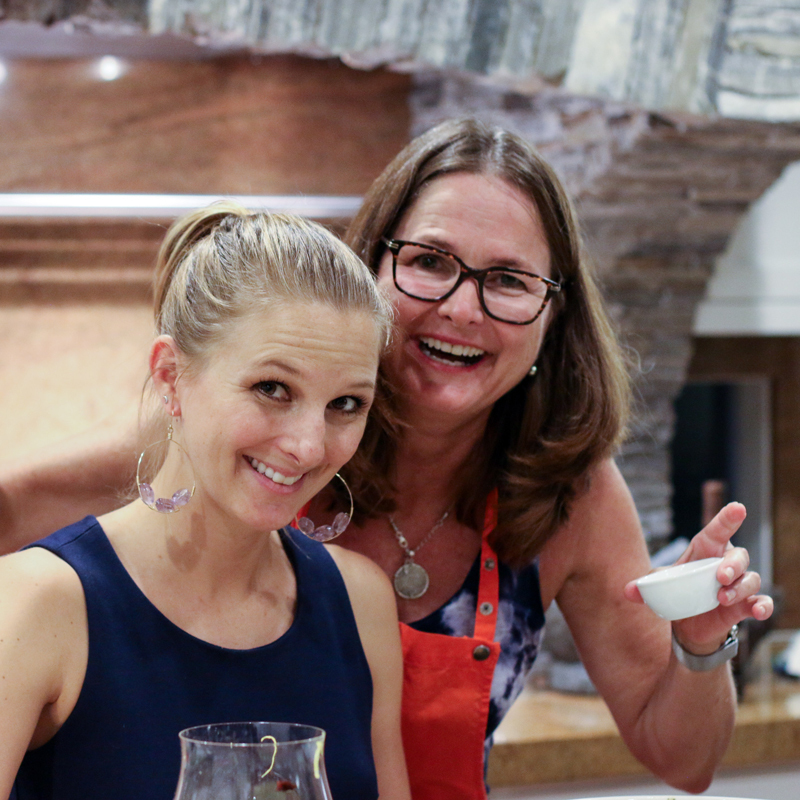 Like all panna cotta, this dessert is gluten-free. 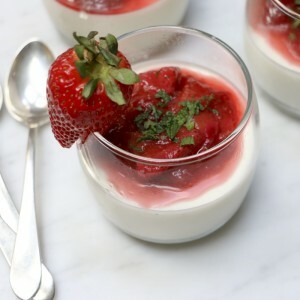 Cherry panna cotta makes a wonderful, cool, summer dessert. Best of all, it can be made ahead of time. Put water in a small bowl and sprinkle with gelatin. Set aside for 15 minutes until softened. In a large bowl, whisk 1 cup whipping cream and all of the yogurt together. Set aside. Over medium heat, put remaining cream, 1/2 cup sugar and 1 T vanilla paste in a small sauce pan. Stir until sugar is dissolved and cream begins to simmer. Remove from heat. Add the gelatin to the hot cream pan mixture and stir to dissolve the gelatin into the cream. Add hot cream and gelatin mixture to bowl of cream and yogurt, and stir to combine. Divide mixture into individual serving cups. Let cool to room temperature and cover with plastic wrap. Refrigerate at least 3 hours or overnight. Make the compote by putting the cherries, 1/2 T vanilla paste, 1/8 to 1/4 cup sugar (depending on sweetness of your cherries), lemon zest, lemon juice and water in a sauce pan. Bring to a boil and reduce heat to medium. Cook, stirring occasionally until the liquid thickens, about 15 minutes. Remove from heat and discard the strip of lemon zest. Let cool and refrigerate until ready to serve. Before serving spoon the cherry compote on top of each of the cups of panna cotta, dividing the compote evenly between the cups. Serve with a sprig of mint. My 80 plus uncle would so appreciate your 70 plus reference :-)! Hugh and I are thrilled to get this recipe! Best dessert ever!!!!! He was such a charmer. I think charm makes you young. 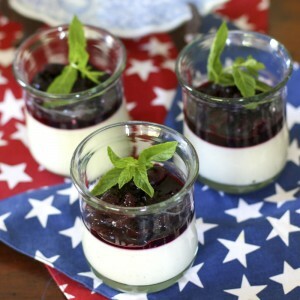 Enjoy this panna cotta while the Oregon cherries are plentiful, then make it in the fall with roasted figs.